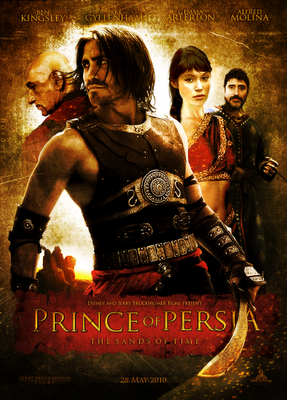 Okay, here’s my first movie review: Prince of-Persia Sands of Time. I initially blew this movie off because of people saying it was a “grand waste of time” and “you’ll wish you had the Dagger of Time so you could reclaim the hours watching it” or “the trailer was the best part of the whole movie”. Well, after finding the bluray copy on sale, I finally decided to give it a shot. I was pleasantly surprised. The characters were well acted (despite having little depth) and the plot had just enough twists to keep things going through the classic PoP-style acrobatic/action sequences. The music was also very good, being done by the same composer responsible for Narnia. A side note for gamers who have played the PoP Sands of Time video game, the only thing in common between the two is the name and the dagger. The characters are almost all different and the plot has been completely changed. There is no evil vizier; the Prince(Dastan) is an adopted son of the king; and the plot revolves around the King being murdered and Dastan being falsely accused. So who else has watched this? Did you like it? Or was it a giant waste of….time? Throw your nickel & two sense in the comments.